Cave passage names originate in one of two ways. First, names can evolve organically over the course of exploration. Someone will nickname a passage and share the name with their teammates and before long, the name sticks. Other times, names are given after an expedition, when the explorers are working on cartography. Both types of names may end up on the published cave map. These names become essential for describing routes and finding key landmarks underground. In 2012, Jeremy Bruns discovered the entrance to a cave on a mountain plateau near Fernie, B.C. Subsequent expeditions into the cave, including the 2018 Royal Canadian Geographical Society-supported Bisaro Plateau Caves Project, of which I was a part, confirmed it to be the deepest in Canada. Pte. Bisaro served in the Royal Highland Regiment of Canada, better known as the Black Watch. Some of the most amazing features in the cave have been named after this storied regiment. 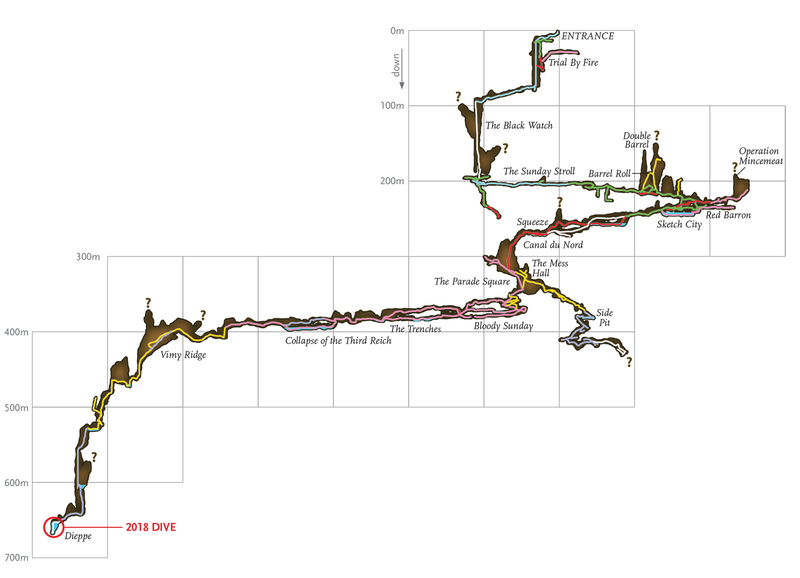 The longest shaft in the cave is a 105-metre drop—the equivalent of a 35-story building. Looking over the edge into the abyss, even the most powerful headlamps cannot penetrate the darkness. Its name, “The Black Watch,” conveys the double meaning of an ominous pit and Pte. Bisaro’s regiment. A 60-metre drop, one of the first in the cave, bears the name “Trial by Fire.” It is a long descent or ascent, requiring physical fitness and technical skill on rope. It’s an intense introduction to the challenge of exploring Bisaro Anima. The names of “The Parade Square” and “The Barracks” were inspired by their form and function. The Parade Square is a large room and junction passage approximately halfway to the current known bottom. Its vast space and high ceiling would be perfect for bellowing drill commands to a platoon formed up in ranks. Instead, the sound of a waterfall pouring into the room echoes off the walls. To the side of the Parade Square, in an alcove, is The Barracks. At 312 metres deep, it is the site of Camp I, which sleeps three to four cavers. In Commonwealth militaries, battle honours are given to regiments to recognize their achievements in campaigns or wars. The Black Watch fought several significant battles in both World Wars, for which they received honours. Passages in the cave now reflect that history as well, with names like “Canal Du Nord,” a First World War battle and a channel in the cave characterized by knee-deep cold water, and “Vimy Ridge,” a vast underground scree slope near Camp II named for the decisive 1917 battle in which four Canadian divisions fought together for the first time. Most recently, in October of 2018, a new underground river was found flowing through a series of passages below Camp I, at a depth of 500 metres. The maze-like area of cave is now called “The Rhineland” and the river “The Rhine.” The origin of the water is unknown and unexplored leads still exist in this area. Explains Graham, “My understanding of Dieppe is that commanders were over-eager to send in troops, and underestimated the enemy.” The Dieppe Raid was the first action for the Black Watch in the Second World War. It was a significant and costly battle for Canada: 907 Canadians were killed, 586 wounded, and 1,946 captured. The team returned to Dieppe on New Year’s Day 2018. 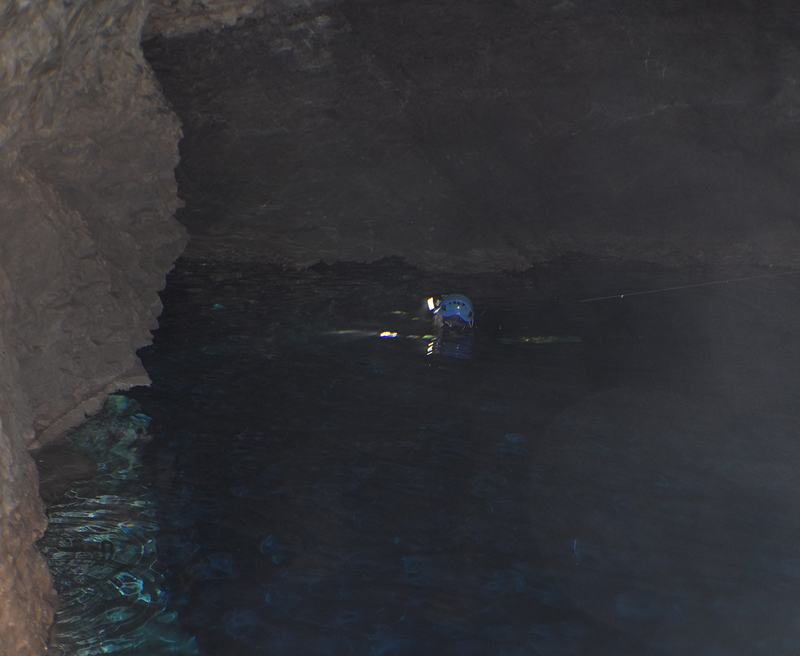 There, Graham completed a cave dive and measured fifteen metres of additional depth in the sump. This dive, one of the most remote ever completed in our country, confirmed this cave to be deeper than any other in Canada and the continental United States.